Gone God: In Movies and Marriage. I recently saw two movies that could not be less similar in story and genre: Gone Girl and Annabelle. While these movies in many ways differ greatly, the themes of family and married life are prominent in both. In light of the Extraordinary Synod on the Family currently taking place in the Catholic Church, there is a call to renewal and deeper conversion regarding the connection between family and faith. (Rated R)***Content Warning: Please note that there is mature content in ‘Gone Girl’ not appropriate for children or teens. There are three sexual encounters that are shown using quick edits and low light, but there is no question as to what the two people are doing. There is also one violent scene that is in the context of a sexual encounter. This scene is cut more slow and dwells longer on it. The violence in this one scene is truly disturbing. It lasts for only about 15 seconds but the camera is very direct and it is very bloody. This makes this scene seem longer than it really is because it is very graphic. David Fincher’s “Gone Girl” is a dark, cynical portrayal of a marriage that goes from storybook to horror story as the couple faces difficult trials. The couple, Nick and Amy Dunne, begin with aspirations of being completely real and transparent with each other. But, then a loss of job, a resistance to having children, a move, and the death of Nick’s mother pull this couple further and further apart. With the loss of work by Nick, he becomes drawn in on himself and bored. He sits around playing video games. When Amy’s once-wealthy parents face tough times, she offers to give up most of the money that the parents had left to them in order to help her parents. Amy did this without speaking with her husband. God is not mentioned except for using His name as a curse. God is the one most gone in this story. We see decadent homes, bars, libraries, restaurants, and a park with a gazebo. But no one goes in or near a Church. I was pretty surprised, given that part of the movie occurs in flashback showing the early days of the couple’s relationship, that the marriage ceremony is not depicted. Ironically, for a movie that is very focused on this couple’s marriage, the movie never shows us the moment that the marriage began. There is a brief scene that shows some of the reception and the wife is wearing a black dress. She jokingly comments that she bucked the cultural tradition of the bride wearing white. The movie does portray their first sexual encounter (which occurs before their marriage). And it is at this moment that Amy says something like, “I think I really love you, Nick.” So, according to this story, love, commitment, and relationship are rooted in the feeling experienced in a fleeting sexual encounter. For those who haven’t seen the movie, I will not tell you where this story ultimately goes except for saying that the people become less and less real to each other as the story progresses. The movie seems to be sending a message about the danger of living out of false images and perceptions. It also paints the news media in a very unfriendly light. But, these messages are the easier ones we can turn to as scapegoats. For, living from just perceptions and the social media juggernaut are both monsters of our own making. They are consequences of the deeper issues we have not been willing to confront or address. At the center of ‘Gone Girl’ are two people who are trying to ground the ultimate meaning of their existence in their relationship with each other. When both of them realize that this person cannot meet this hunger for meaning, they become disenchanted. The whole movie is this conflict between the loss of and the seeking of meaning. One of the early scenes of Nick and Amy’s relationship when they first kiss is one that seeks to connect meaning. They are walking by a bakery where workers are loading bags of sugar into the back of the building. Some of the powdered sugar, being very fine, has filled the air and looks like snow. The couple walk through it and Nick sees that sugar has coated Amy’s lips. He brings his thumb to her mouth and wipes the sugar away to kiss her. From then on, the wiping of the thumb over the lips is a symbol and a signal meant to convey meaning. It is one of the threads meant to connect the two as the story progresses. It conveyed that Nick was wanting to wipe away the sugar coating and be truly connected to the real Amy. But, this symbol is still a fleeting one. It connects you to a moment but doesn’t connect you eternally. I contrast the sugar gesture with the Christian gesture of making the sign of the cross. That gesture is full of meaning and it doesn’t just connect you to a moment in time, but connects you to an eternal person that seeks to be in communion with all of us: Jesus Christ. For Amy and Nick, they make no move to connect with an eternal end or meaning. They descend into a Dante-like hell of meaninglessness. The white wedding dress is tossed out because it means nothing. The business that Nick starts with his sister Margo is a bar that is just called “The Bar.” Another character jokes that naming the bar that is very “meta.” But, what it seems more to do is to show a complete disconnection to meaning. There is no image or name connected to the business. It just is, without any connection to history, community, or person. A little later in the story, Nick is to the point of wanting to end the marriage. He expresses in exasperation, “You’re delusional. I mean, you’re insane, why would you even want this? Yes, I loved you and then all we did was resent each other, try to control each other. We caused each other pain.” Amy responds by saying, “That’s marriage!” At this moment, I wanted to yell at the screen. For all the ways that this movie portrayed poor behavior by both spouses, it was this interaction that really bothered me. The words of Amy are true only to the point that they are built on an incomplete and half-truthful premise. Amy would have spoken truthfully if she had said, “That’s marriage without God.” What is deeply tragic about the movie is that it could lead couples struggling in their marriage to conclude that this is where you can expect to end up in a marriage relationship. It is obvious that many aspects of the story are exaggerated and I am not suggesting that people will not realize the fictitious extremes. But, the problem lies in the fact that there is nothing offered in contrast to these extremes. When Amy says, “That’s marriage.”, it would be easy to believe her based on the movie not providing any counter examples of marriage by any other characters. If a counter example was offered during the course of the movie of a couple with a healthy marriage that was real and grounded in love of God and each other for the sake of the other, then when Amy says that line it would ring more hollow because in the back of our minds we would be remembering a better way that this couple chose not to travel. That was a time when a Bishop simply talking directly to people through television was one of the most watched programs in the U.S. Those days are long gone. If you want to read more fully, Sheen wrote a classic books titled: “Three to Get Married”(click title to go to open link to Amazon book listing). 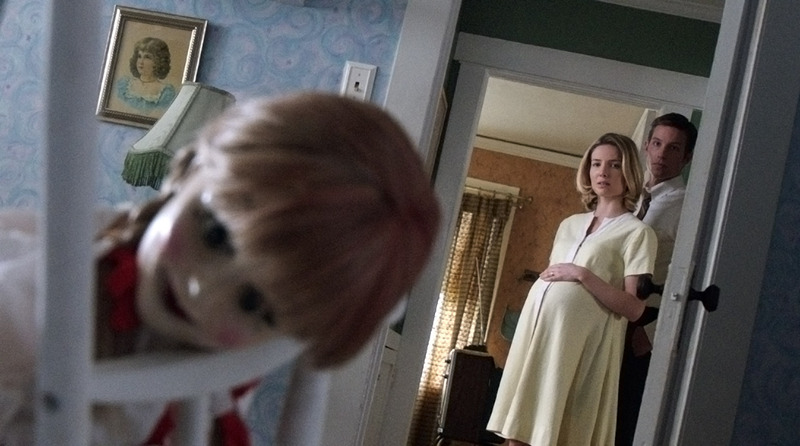 While ‘Gone Girl’ gave us a bleak image of married life, what we have at the center of the low budget horror movie ‘Annabelle’ is the last thing you would expect: a pretty good marriage! I was truly surprised by Annabelle. Okay, the acting is nowhere as strong as it is in ‘Gone Girl’. You can see the limitations placed on the budget in their casting choices. But, it is intriguing how the characters are written. Both adults in the movie act in a logical way and that is saying a lot for a horror movie. When the pregnant wife begins to experience strange occurrences in their home surrounding a doll they purchased, she expresses to her husband that she doesn’t want to endanger her baby and that they should move. The husband, who in many other movies would dismiss his wife’s concerns, actually treats his wife with deep respect and they up and move to a new place in a different town which is closer to the hospital where he works. The husband is fully present to his wife and they communicate well. When the husband and wife begin to face greater threats from this evil presence the husband suggests that they seek out some help. The wife initially protests and says, “I don’t want to go to some shrink.” But the husband says that this is not what he had in mind. While the wife is the only one so far in the story who has been traumatized by this malevolent demon, the husband suggests they go together to talk with a priest. He displays a willingness to enter into his wife’s struggle and to face it with her. He even goes so far to express that when his parents faced difficult times in their marriage, they turned to God and the Church and were greatly helped. Then, in an even greater surprise, the priest in this story is helpful and supportive of the couple. It was a breath of fresh air to see a couple attend Mass regularly, to see them seek the help of their pastor and receive good help. Not since the original Exorcist have I seen such a roundly positive portrayal in a mainstream movie of the priestly ministry in the lives of people in the Church. (Yes, I am conscious of good movies such as Doubt and Calvary. But, those were movies to a limited audience. They were not blockbusters made for a wide audience.) The ending of the movie I believe was mishandled. I will not spoil what happens, but it rings false to everything that preceded it. There was a better direction they could have gone to close out the story. And what does happen does not communicate a good message concerning the triumph of God over demons through the ongoing work of Christ. I think you’ll see what I mean. Regarding the central message of the movie concerning the couple’s marriage, I believe it offers a great vision of what a marriage can be that has God in a central place. In Annabelle, the demon the couple faced was literally real and they chose to seek help from God and trusted friends. In Gone Girl, there were many metaphorical demons that are left unaddressed throughout the movie with the relationship descending to a place of despair. Two visions of marriage offered by two very different movies. If Gone Girl is anything, it could be considered a hopeless warning similar to the sign above Dante’s Inferno “Abandon all hope, those who enter here.” In Annabelle, we are given a parable of potential. A story that offers a vision of two people who look to God, the Church and community for help overcoming a threat to their relationship. The prince of demons would have us believe the first vision is true while the Prince of Peace offers Himself as the image of right relationship with God and in the relationship of marriage.